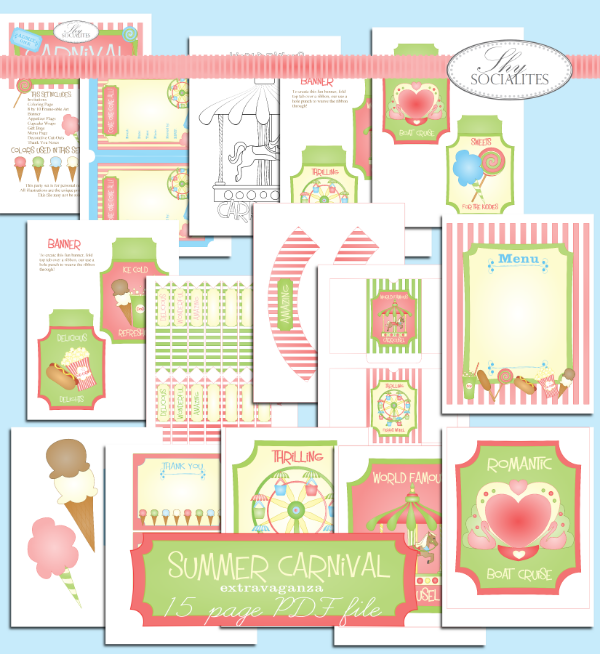 We want to thank everyone who entered our Summer Carnival Give-Away (all 41 of you ) :)! Our Winner, Sara, chose the snow-cone machine, and we think it is the perfect choice. We our planning our next fun give-away, so be sure to check the blog often and follow us on Facebook! *****WIN***** an ICE CREAM PARTY! What is more fun than a party...an ICE CREAM PARTY!! Whether it is a birthday party for a special kid, or a sophisticated ice cream cocktail party, nothing is more fun that the sweet cool treat, and you could WIN an entire party from the Shy Socialites. One Fabulous Winner will receive ALL of the following! * a consultation with our illustrators and designers * a sample portfolio with a custom color chart, illustrations party favor and decor ideas * a printed set of invitations, favors and decor for 8 * a consultation with Chef Davenport who will help you choose the perfect appetizers and snacks, with your ice cream flavors and guest in mind! * a printed menu for your party guests * ice cream service set for 8, chosen to coordinate with your party * additional decor items chosen to coordinate with your party * party games chosen especially for your party * assorted sprinkles and ice-cream toppings chosen for your party * $20 gift-card for purchasing ice cream and snacks! How do you win? Write to us at info@shysocialites.com Make the subject line "Ice Cream Party". When you write your address will be added to our email list, a list we are compiling for a future newsletter to be filled with all sorts of wonderfulness (we do not send emails out more than once a week, unless you write us directly, in which case we will write you back) If you would like to be on our print-mailing list, include a physical address the body of the email. That is it, you will then be added to the random drawing. You do not need to do anything else, just write to us. Of course,we would love it if you would share a link to this post with all of your friends, the more the merrier, and if they win, I am sure you will be invited to the party! So share, share away, please! The fine print-after your consultation, we may use the invitation we created for you in our Zazzle or Etsy stores, even if your illustration includes a custom character. All personal information will be removed from the merchandise. Your completed party will be added to our portfolio. If you send us pictures (which we would love) please include a small note of permission saying we can use them in our portfolio and/or on our Internet sites. If for some reason we are unable to complete the entire project for the winner, the winner will be sent the $20 gift card, and we will re-play this give-away. Have Fun, cannot wait for the party!